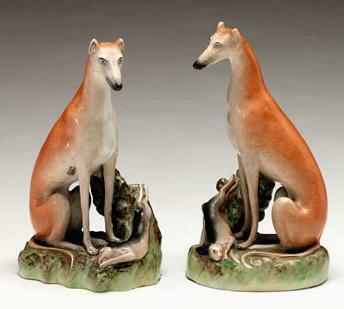 Whippets: These tall whippets are the most graceful of all, from the Thomas Parr pottery c1855. 12" tall they are $2200. If you could use a pair made into lamps, they can be on sale for $1950 ! I've got a great collection of greyhounds and whippets, all colors including black and white, recumbent and standing.....just ask for photos. Newfoundlands: These Newfoundlands with Royal kids in Scottish dress ($1800 for the pair) are based on one of Sir Edwin Landseer's paintings. 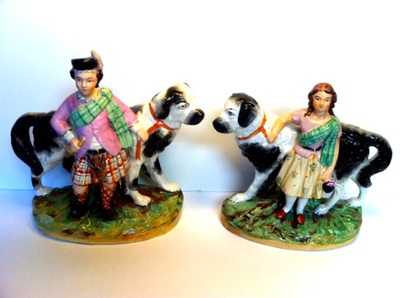 Landseer summered with the Royal Family at Balmoral and his paintings provided a rich trove of source material for the potters' figures, for needlepoints and other art forms of the period. 10". 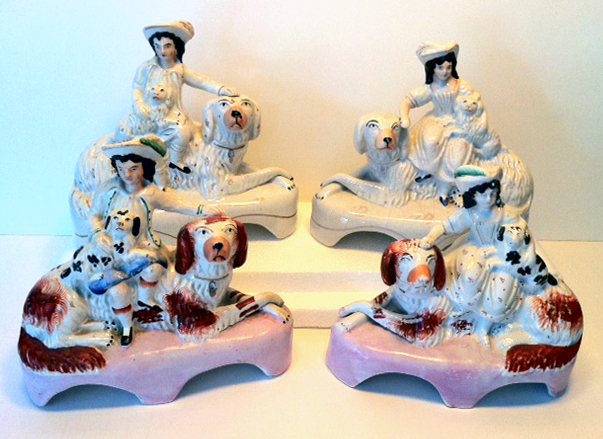 Royal Children: Pair of Royal Children on recumbent spaniels came in white, cobalt blue and, rarest, pink bases. White is $950, cobalt blue $1150, and the rarest, pink bases are $1550. These figures are 6 1/2 inches wide, 6" tall, c.1855. ﻿Pugs: ﻿ Even the tallest pugs come in pairs but display well as singles. The ten inch pair of seated pugs is $1100 as are the pair of free standing ones 6 1/2 inches tall. The huge one at the rear is $850. 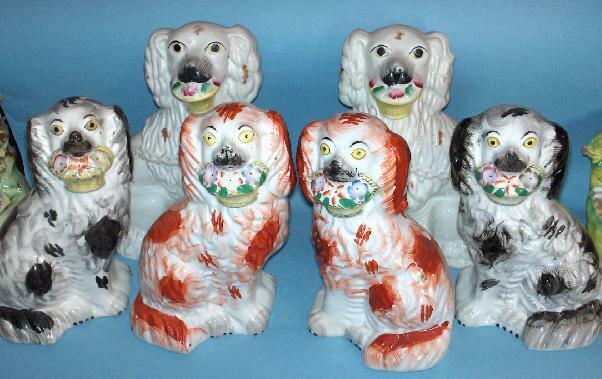 Pugs were manufactured about 20 years after spaniels. 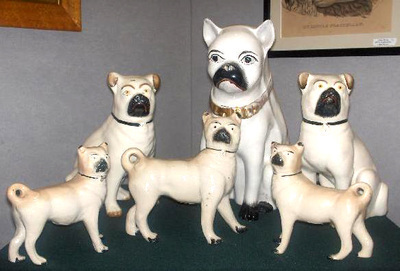 Queen Victoria was given a pug by a son-in-law and a photo appeared in the news; two weeks later pugs were everywhere. Basket Dogs: Basket dogs, black and white, with Disraeli curls are quite expensive, more than $1000 for a pair. 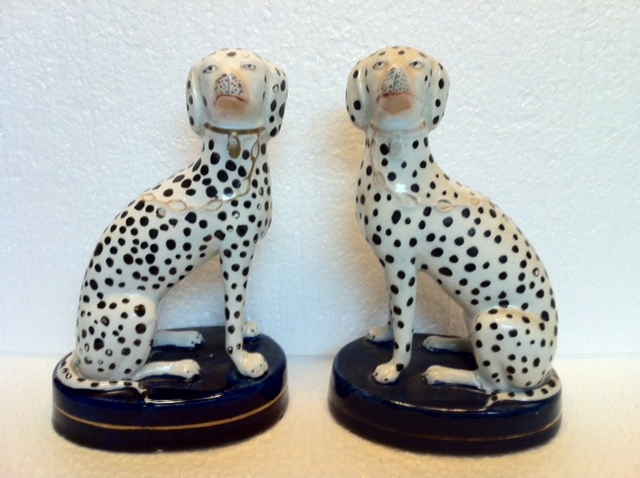 My red and white basket dogs, 8 inches tall, are $900, and I have a pair of white 7 1/2 inch ones on sale for $600. All 1860. 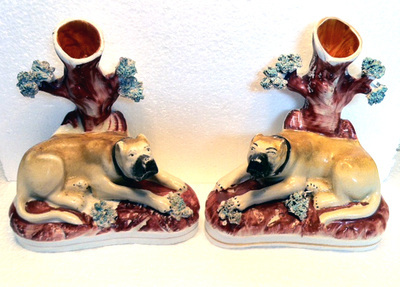 Mastiffs: Pair of beautiful mastiff spill vases c. 1855, 6 inches tall, pottery is Thomas Parr, see A-Z Book of Staffordshire dogs, page 122. $ 1150. 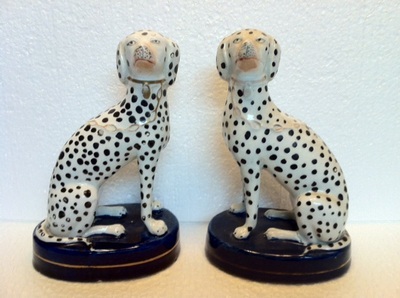 Dalmations: Pair of dalmations c. 1850, 5 inches tall, cobalt bases with old gold line.See A-Z Book, page 25. $625 for the pair.